When I plan out my menu for the week, I usually put easier recipes, like burgers toward the end of the week because come Wednesday and Thursday, I am significantly losing steam in the dinner making process. This always mean that I just pick up a package of burger buns at the store and go on my merry way. Ever since the secret recipe club reveal back in June, where the Pajama Chef made blueberry burgers on pretzel rolls, I’ve really wanted to try out making my own rolls, especially those of the pretzel variety. Pretzel rolls still aren’t very common here. Sometimes you can find them in the stores and other times, the employees look at you like you’ve grown an additional eyeball when you inquire as to where they are. The one place, where you can always get a sandwich on a pretzel roll though is Sheetz and I am forever thankful to them for introducing me to that particular variety of deliciousness. 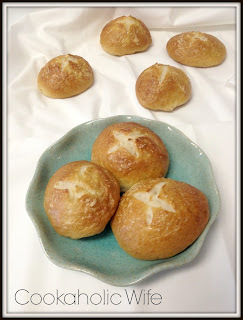 Anyway, I had a Sunday with not much to do so I decided it was the perfect time to try out making some pretzel rolls. And I even had two burger recipes planned for the week which we could eat them on! 1. Stir together the water and yeast in the bowl of your stand mixer with the dough hook attached. Let rest for 5 minutes until foamy. 2. Then add the sugar, flour and 2 tsp. of Kosher salt and butter. Mix on medium-low speed for 4-5 minutes or until a dough ball forms. 3. Cover with plastic wrap and let rise until doubled, about 1 hour. 4. Line two large baking sheets with parchment paper. 5. After the dough has doubled, punch it down and turn it out on a lightly floured surface. Divide the dough into 12 pieces. 6. Roll each piece of dough into a ball, and pinch any seams in toward the center of the ball. Place seam side down on the prepared parchment paper, 1 inch apart. Cover with a clean kitchen towel and let rise for an another 30 minutes or until the dough has doubled again. 7. Adjust the oven racks to be on the lowest and middle position. Preheat the oven to 425. 8. Bring a large pot of water to a boil. Once boiling, add in the baking soda (it will foam up) and reduce the heat to a simmer. 9. Using a slotted spoon drop 3-4 rolls into the boiling water and poach for 30 seconds. Flip the rolls over and poach for another 30 seconds, then remove, shaking off excess water and return to the prepared baking sheet. 10. Repeat with remaining dough balls. 11. Brush the tops of each dough ball with the lightly beaten egg. Use a sharp kitchen knife to cut an “X” into the top of each ball. Then sprinkle with Kosher salt. 12. Bake for 15-20 minutes or until golden brown. Transfer to a wire rack to cool. I kind of wish that I had doubled this recipe so we could have rolls to just eat without a burger. 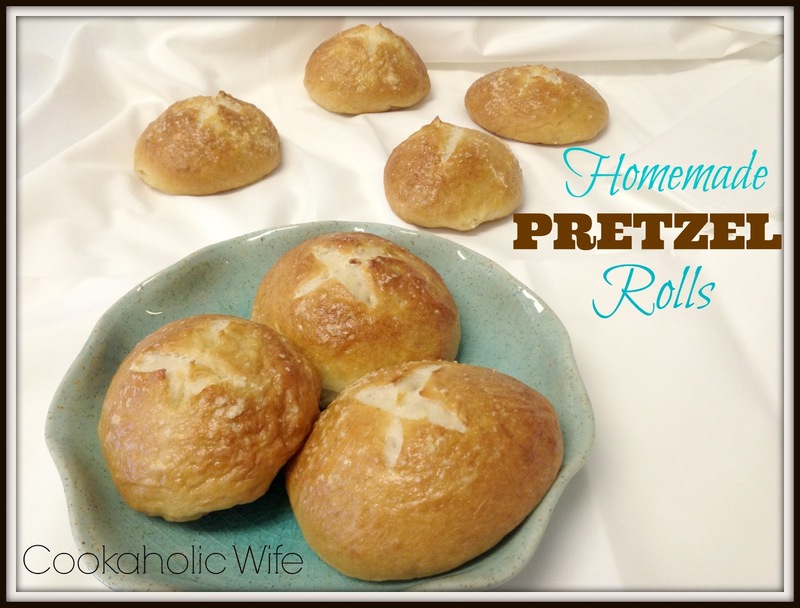 These pretzel rolls were SO good. They were perfectly chewy and had just the right amount of salt. I unfortunately created a monster though. Tom said that the rolls were delicious and asked that I could please make homemade burger buns as often as humanly possibly now because they don’t even begin to compare to what you can get in the store. I guess its good for me that he can make bread so I can have him make his own rolls sometimes, right? This post linked with: Time to Sparkle, Tuesday’s Table, and Tuesday Talent Show! I would be like you and want to eat the rolls before they ever made it to the burger! They sound fantastic. Thanks for linking up with What's Cookin' Wednesday!